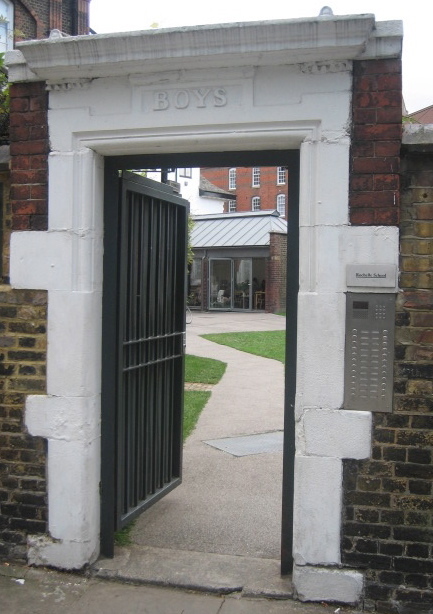 Through this door in Arnold Circus, you will find the Rochelle Canteen situated in the former bicycle shed of the Rochelle School, now run by James Moores’ A Foundation as a complex of artists’ studios and gallery. The shed has had a coat of white paint, a steel kitchen has been installed in one end and white dining tables placed at the other. Beyond the word “canteen” on one of the buzzers at the gate, there is no indication out on the street that the Rochelle Canteen exists. But this did not stop Evening Standard food critic Fay Maschler picking chefs Margot Henderson and Melanie Arnold’s canteen as one of her top new restaurants when they opened. I was taken there recently for a birthday lunch, the two of us shared an impressive large black bream cooked to perfection and served with new potatoes and fennel, all for £20. Even after a couple of years, this undercover canteen remains Shoreditch’s best kept secret. 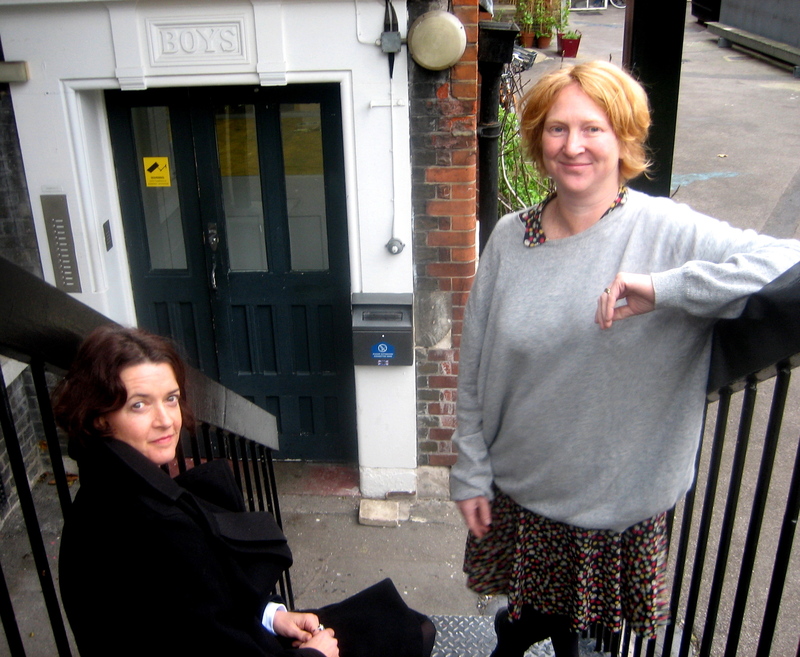 I sneaked round there one morning last week to meet Melanie and Margot and they explained how they ran a catering business from Margot’s flat in Covent Garden before James Moores invited them to open the canteen at the Rochelle School. The idea was not just to cook food for the artists who have studios there but to create a space where people from the neighbourhood could eat too, connecting the school to the surrounding area. It certainly is a fascinating clientele that turns up for lunch. Last time I was there, I was intrigued by a man at the next table examining contact sheets of Wes Andersen with the animated figures from “Fantastic Mr Fox,” the next time I saw these one of these beautiful pictures by Tim Walker was when my copy of The New Yorker flip-flopped through the letterbox a month later. Interviewing Margot and Melanie is like being the supply teacher sized up by the flirtatiously giggly top girls from St Trinians. Maybe it is the influence of the schoolyard environment? There is no doubt they are a pair of professionals at the top of their game, two serious and stylish women – Margot in an elegant print dress and Melanie with an impressive pair of heels. Sitting at table with them, you quickly appreciate an interesting dynamic that reveals a genuine feeling for the creation of wonderful food, leavened by a refreshingly down-to-earth attitude. While Melanie is trying to persuade me to have toast and marmite, Margot blushes as she searches like a poet for satisfactory language to describe their approach – because all the vocabulary she might have used (including adjectives like “seasonal” and “regional”) has been co-opted by our more venial supermarkets. “Simple food prepared with respect and love” she ventures and then, as she returns striding proudly across the restaurant with today’s menu, adds “gentle food that lifts you up.” She points out Venison & Carrots, “This is the dish of the season” she says with authority. “There’s no fuss here”, confirms Melanie with a smile, raising an eyebrow seductively as she draws my attention to Rice Pudding & Prunes, the perfect comforting autumn dessert. Now I am beginning to feel hungry. “Don’t forget to tell everyone we open for breakfast from 9 o’clock” adds Melanie, as we venture outside to take the picture below. Oh my! You just keep me coming back and back! The menu for today looks delicious but it was a mistake to check it out while I ate my pre-packed sandwich which seems rather unappetising as a result.